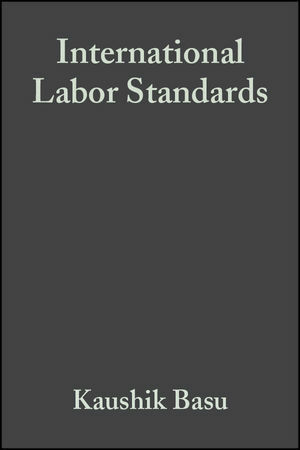 This book addresses the controversial call for international labor standards, seeking to productively further this debate by considering the economic implications and history of these standards. A result of an initiative by Professor Kaushik Basu in his capacity as member of the Expert Group of Development Issues (EGDI) sponsored by the Swedish Foreign Ministry, the contributions are based on discussions at a seminar held in Stockholm in August 2001. Compiling the best research in the field, this book provides a solid basis for policy decisions, while also serving as a challenging text for students in trade, development, and labor economics. Analyzes the economic implications and history of international labor standards. Productively furthers the debate about intervening with international labor standardsStems from a seminar organized through the Expert Group on Development Issues (EGDI), sponsored by the Swedish Ministry of Foreign Affairs. Kaushik Basu is Professor of Economics and Carl Marks Professor of International Studies in the Economics Department at Cornell University. He is Editor of Social Choice and Welfare and Associate Editor of The Journal of Economic Perspectives and The Journal of Development Economics. He is the author of many books and articles, including The Less Developed Economy, (Blackwell Publishers, 1984), Lectures in Industrial Organization Theory (Blackwell Publishers, 1993), and Analytical Development Economics (1997). Henrik Horn is Professor of International Economics at Stockholm University. His current research focuses on various aspects of the WTO, with particular emphasis on the functioning of its Dispute Settlement system. Lisa Román is the Secretary to the Expert Group on Development Issues (EGDI) and has been with the secretariat since 1999. She has a background as a development economist and is the author of Institutions in Transition: Vietnamese State Bank Reform (1999). Judith Shapiro is Professor of Health Economics at the New Economic School, and has been a member of the EGDI since 1995. She is the author of a number of articles on Russian health, labor and mortality, and three co-authored books on transformation and integration in Eastern Europe. Introduction: Kaushik Basu, Henrik Horn, Lisa Román, Judith Shapiro. Part II: The Evolution of Labor Standards:. 1. The History and Political Economy of International Labor Standards: Stanley Engerman (Rochester University). Commentary 1.1 The Parallels Between the Past and the Present: Jane Humphries (All-Souls College, Oxford University). Commentary 1.2 Legislation Versus Bargaining Power: The Evolution of Scandinavian Labor Standards: Karl-Ove Moene and Michael Wallerstein (Oslo University). Part III: The Theory of International Labor Standards:. 2. The Impact of International Labor Standards. A Survey of Economic Theory: Nirvikar Singh (University of California, Santa Cruz). Commentary 2.1 Old Wine in New Bottles? : T.N. Srinivasan (Yale University). Commentary 2.2 Governing Labor Relations: Tore Ellingsen (Stockholm School of Economics). Part IV: The Issue Of Child Labor:. 3. Child Labor: Theory, Evidence and Policy: Drusilla Brown (Tufts University), Alan Deardorff (Michigan University), and Robert Stern (Michigan University). Commentary 3.1 The Political Economy of Child Labor: Alan Krueger (Princeton University). Commentary 3.2 Social Norms, Coordination and Policy Issues in the Fight Against Child Labor: Luis-Felipe López-Calva (El Colegio de Mexico). Part V: The International Organisation and Enforcement of Labor Standards:. 4. A Role For The WTO: Robert Staiger (University of Wisconsin). Commentary 4.1 Trade and Labor Standards. To Link or Not to Link? : Alan L Winters (University of Sussex). Commentary 4.2 The Need to Micro-Manage Regulatory Diversity: Petros Mavroidis (University of Neuchatel). Stems from a seminar organized through the Expert Group on Development Issues (EGDI), sponsored by the Swedish Ministry of Foreign Affairs.